V4.x swings back to bearish. $NYXBT (Bitcoin), 10/16/18, bear trend signal. TSP will be the close of the following trading day. Model notes: V4.x the previous signal was a little shorter than usual. 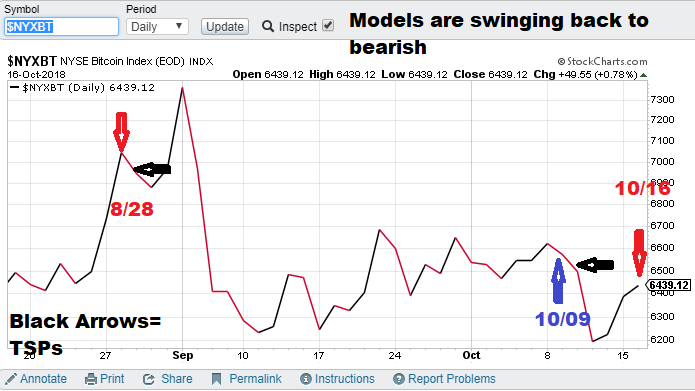 Models need to be flexible enough to be able to adjust with probable trend changes. 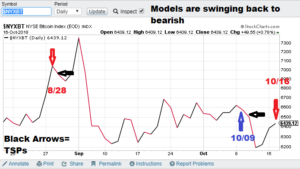 Bear Trend Signal ($NYXBT): The models now are signaling a retest of the 6000 level. Previous PostV4.x issues a bull trend signal!Next PostModel scores with recent short signal, issues a bull trend signal!